Click on photos of hand made lokta envelopes below for more info & to see a larger view! Single Red DL envelopes for Chinese New Year! and for Valentines Day! 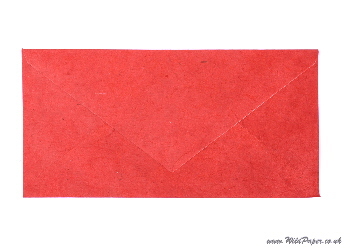 Deep Scarlet or Crimson Red handmade lokta paper envelopes in DL size are ideal for paper money gifts for Chinese New Year! or for cards for Valentines Day! One or 2 envelopes bought together will qualify for our lowest postage rate of only £1.35p! Sent in cellophane wrapper inside a boardback envelope. We stock 3 sizes of handmade paper envelopes in natural lokta paper with the standard large triangular closure flap. These are designed to hold A3 and A4 letter paper when folded in either 3 or in 4, or smaller sizes, of course. We also stock very attractive DL+ size Button and String Closure Envelopes, see below. The Lokta DL envelope is 110 x 220 mm (approximately 4 1/3 x 8 2/3 inches) and holds an A4 sheet folded twice into 3 parts. This is the most common size of envelope and most offices send out their branded stationery in this envelope size. Whilst this is the most popular size it does involve folding your stationery in three and some people may prefer not to do this and may therefore prefer to use the C6 size. The Lokta C6 envelope is 114 x 162 mm (approximately 4 1/2 x 6 3/8 inches) and holds an A4 sheet folded twice into quarters, an A5 sheet folded in half or a small card. This is the most common size of envelope for domestic use and is very easy to fold the A4 letter paper into the envelope. The Lokta C5 envelope is 229 x 162 mm (approximately 9 x 6 3/8 inches & twice the size of a C6 envelope), and holds an A3 sheet folded twice into quarters, an A4 sheet folded in half, an A5 sheet unfolded, or a large card. This is a common size of envelope for large greeting cards and is very easy to fold an A3 or A4 letter paper into the envelope. We sometimes stock very attractive DL+ (sometimes called “C6/C5”) Button and String Closure Envelopes that are 114 x 232 mm (approximately 4 1/8 x 9 1/8 inches) and will hold an A4 sheet folded twice into 3 parts just as the DL envelopes do. These are pocket envelopes with a short rectangular flap on the short side of the envelope that are closed by winding the string supplied round the second button. They are ideal for giving small gifts including money or cheques if you are presenting them by hand or sending by post if the contents are not too valuable (for example a card). Remember that these are handmade envelopes and that the exact sizes may vary but there should be adequate clearance to ensure that A4 handmade computer paper will always fit. None of our handmade envelopes is gummed, but you can use a closure method of your choice. If you would like to buy envelopes in dyed lokta paper to match our printer paper, please let us know which handmade paper you would be interested in matching, via the contact us form.